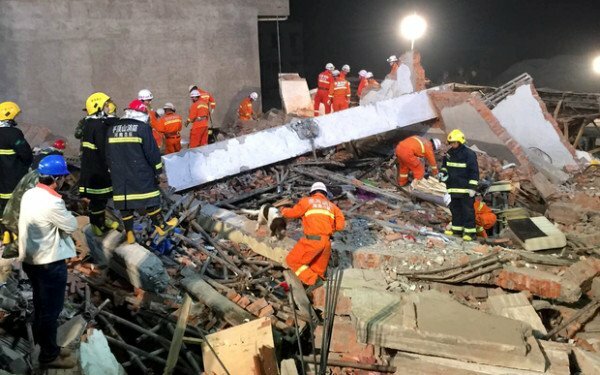 At least 17 construction workers have died after a two-storey building has collapsed in China’s central Henan province, state media has reported. Other 23 people are reported injured in the accident. Rescue workers searched overnight pulling bodies and survivors from the debris in Beiwudu in Wuyang county. Nine of the injured, being treated at a hospital in nearby Luohe city, are in a serious condition, officials said. Renovation work was being carried out on the foundations of the building when the accident happened, they said. The local government in Wuyang county has now called off the search for survivors. An investigation is under way to establish the exact cause of the accident, which happened on October 30. It will renew concerns about enforcing building safety regulations in China, correspondents say. In May, a nursing home in Henan province that was destroyed by fire, killing 38 people, was found to have been poorly constructed using flammable material. One of the survivors from October 30 collapse told state-run CCTV that many of the workers had come from Nanyang city in south-west Henan province to work on the site. Some of his colleagues had previously worked as farmers and had received little or no training, one man, Feng Guoqing, said. They had been using a lifting jack to push up a corner of first floor, but the jack suddenly gave way leading to the collapse, he said. Chinese officials said the building had been built in the 1990s.